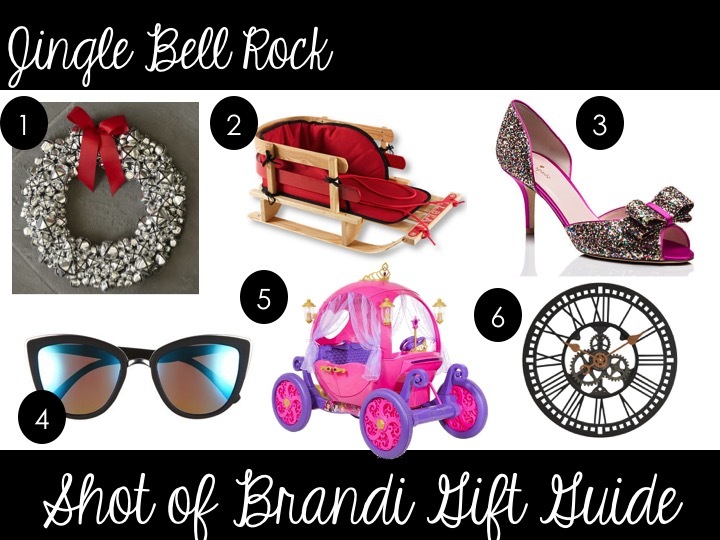 The theme of this year’s Shot of Brandi* Holiday Gift Guide is Christmas songs! “Jingle Bell Rock” is like regular “Jingle Bells” cooler cousin. It has similar lyrics, but with a more upbeat spin. While the song has been covered by a lot of artists, I think my favorite pop culture moment with this song is the famous Christmas pageant scene in Mean Girls. 1. It’s very festive if you have those bells ringing from your door. Make that happen with this jingle bell wreath from Williams-Sonoma. 2. Sometimes snow is fun. You look at it coming down and laying a beautiful blanket of white fluff on your lawn. A sled is necessary to play in the snow! There are a lot of sled options out there, but I’m going to pick this one from L.L. Bean based purely on the fact it’s cute. 3. I don’t know where jingle bell square is, but if you are going to be dancing you need some dancing shoes. Let me suggest these bedazzled beauties from Kate Spade. 4. If it is a bright time, you need some new sunglasses. All of the bloggers that I follow are always posting their Quay shades, so they must be “in.” They are reasonably priced a little over $50. Finally something fashion bloggers over post that’s under $500! 5. You don’t even need a horse to ride in this most amazingly awesome motorized Disney Princess Carriage. This is totally one of those “why didn’t they make that when I was a kid” moments. 6. This one was almost too easy. How about a clock! This gear clock is pretty rad!